1. To represent something by means of a symbol. 2. To express indirectly by an image, a form, a model, or to represent something: For many people, flowers symbolize love and affection for someone. A general mechanism by which some mental representation comes to stand for some other thing, class of things, or attributes of something. An abnormal bodily condition in which there may be three feet (tripodial sympus), two feet (dipodial sympus), one foot (monopodial sympus), or no feet (apodal sympus or sirenomelia). A fetus with symmelia which is a developmental anomaly or the absence, deformity, or excess of body parts as the result of faulty development of the embryo which is characterized by the apparent fusion of the lower limbs. 1. A reference to having a similarity in size, shape, and a relative position of corresponding parts. 2. Affecting corresponding parts simultaneously; such as, certain diseases. 1. Descriptive of being characterized by or exhibiting symmetry; that is, well-proportioned, as a body or whole. 2. A reference to being regular in form or arrangement of corresponding parts. 1. 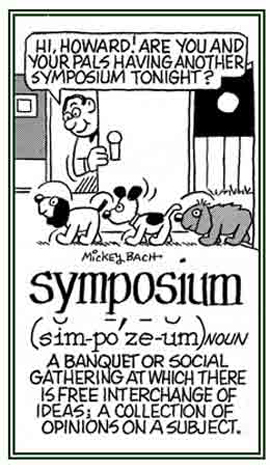 Characterized by, proceeding from, exhibiting, or feeling sympathy; sympathizing; compassionate: "She was a sympathic listener." 2. Acting or affected by, of the nature of, or referring to a special affinity or mutual relationship; congenial: "With their many similar tastes, she found her sister a most sympathic companion."